An alt-right web site, "Red Ice" (apparently belonging to Henrik Palmgren), proposes that there's a nearly worldwide decrease in IQ due to immigration. The Red Ice piece apparently originated from unz.com so clearly this story was more widely circulated in the alt-right circles, circa 2016. (It was listed on the first page of results on my google search for IQ and immigration.) The author of the piece is Anatoly Karlin, whose science-related qualifications are unclear (to me), unlike his political views. The situation in the US is actually considerably better than in Europe – the low-IQ Central Americans, who are not sending their best, are counterbalanced by the millions of talented East Asians, Indians, and other intelligent and highly motivated people who still want to make America their home. 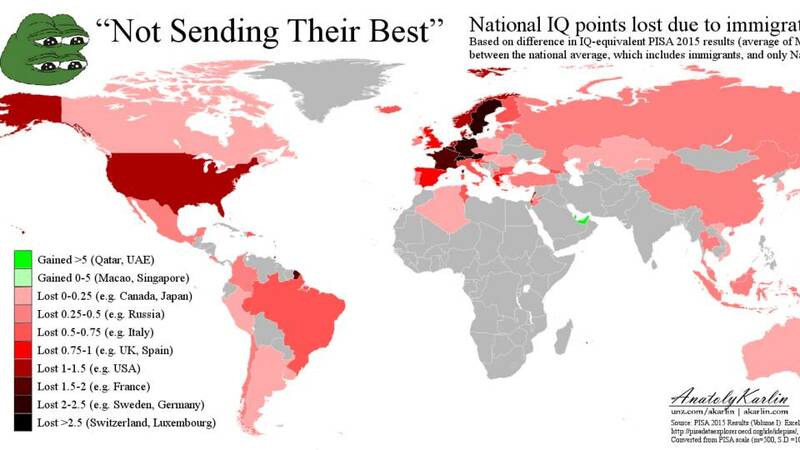 Thanks to that the world’s biggest immigrant nation only loses 1.3 IQ points due to all the newcomers. So is there any truth to (1) the raw PISA data has decreased; (2) does it really correspond to an "IQ" (let's say raw IQ score) decrease; and (3) does it really imply anything about the effects of immigration? The PISA results are available online. [T]he OECD Programme for International Student Assessment, PISA, [is] the world’s premier yardstick for evaluating the quality, equity and efficiency of school systems. It does not measure IQ and does not claim to be comparable to IQ. The summary also provides a table with data about the "Difference in science performance between immigrant and non-immigrant students, after accounting for ESCS and language" (page 8 of the PDF). It is true that immigrant children performed worse in science in many countries (some exceptions are Australia, Hungary, New Zealand, the US, or Israel). The difference is generally reduced in second-generation immigrants (see eg this report by the EU commission, page 21; or this PDF from the OECD, page 2f). According to the report, other explanations may include the language spoken at home, concentration of immigrant students in schools, or differences in access to educational resources. In the majority of countries with comparable data, students’ performance in science remained essentially unchanged since 2006. Not the answer you're looking for? Browse other questions tagged united-states intelligence immigration europe germany . Is immigration causing unemployment among low-skill workers in the UK?